What do Mormons truly teach concerning the three personages of the Trinity? 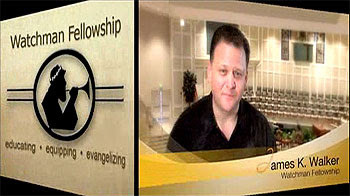 I had the pleasure of asking this question of James Walker, President of the ministry Watchman Fellowship based in Arlington, Texas. James is a former fourth generation Mormon who found the Lord Jesus Christ and since then has dedicated his life in trying to lead people out of the spiritual darkness of the cults. Experts on cults and false religions, his ministry has indexed nearly 1,200 religious organizations, cults, occultic groups, and controversial doctrinal practices to aid people in spiritual discernment. Dr. Reagan: Despite all the clearly unbiblical truths that Mormons promote, Mitt Romney declared that he has accepted Jesus Christ as his Lord and Savior. Does that make him a Christian? A controversy concerning Mormonism finally motivated Mitt Romney to go public and give a speech about his faith. In that speech I want to quote, he said, "I believe that Jesus Christ is the Son of God and the Savior of Mankind." The next morning on Fox News Steve Doocy sighed a great sigh of relief and proclaimed that statement should put to rest all concerns as to whether or not Mitt Romney is a Christian. What about it? Does a statement like that make a person a Christian? James Walker: I tell you what, the problem is you have to define terms. You have to know what's meant by the terminology. I think that probably Mitt Romney carefully chose exactly what he said and what he didn't say to make it sound compatible with tradition Christian faith. First of all, let's look at the term "Son of God." Yes, the Latter-day Saints technically believe Jesus is the Son of God. They'll often add the phrase "in the flesh" as in "only begotten in the flesh." But, you need to understand that Mormons are taught that everybody are sons and daughters of God. They believe that God and his wife have billions of children, and Jesus was just one of the billions of sons of God, though He's uniquely Christ. Mormons may teach that Jesus is "the only begotten Son of God" and "only in the flesh," but by that they mean the Heavenly Father came to this earth, married the Virgin Mary, and begot the Savior naturally. Jesus they say is the only one who was conceived this way. Everyone else may have had human fathers, but Jesus actually was begotten by this special relationship. Even the Mormon prophet himself, Gordon B. Hinkley, who is the top Mormon, prophet, seer and revelator, has on several occasions recently in their LDS church news said that he does not believe in the traditional Christ. So, when somebody says they believe in Jesus, you've got to ask "which Jesus?" Dr. Reagan: Which Jesus? I mean, for example, Jehovah's Witnesses believe He is the archangel Michael. James Walker: Yes, and there's a group out in California who believes Jesus is a mushroom! Yes, it's called the Sacred Mushroom and the Cross. John Allegro is the leader of that group. Second Corinthians 11:4 is where the Bible warns about those who would preach a Jesus other than the Jesus the Apostles preached. Muslims believe in Jesus, yet they don't believe the right things about Jesus. Virtually all the other religions believe something about Jesus. The Jesus of the Church of Jesus Christ of Latter-day Saints is not the traditional Christ. The Mormon prophet himself has said this in a general conference. He's said it in the LDS church news. Hinkley does not believe in the traditional Christ. Dr. Reagan: How does the Jesus of Mormonism differ from the Jesus of the Bible? James Walker: The Mormon Jesus wasn't born of a virgin, in the traditional sense of that. He's one of billions of sons and daughters of the Heavenly Father. Jesus is also the spirit brother of Lucifer, as well as the rest of us. Also, the Jesus of Mormonism according to some early Mormon apostles was married to three women: Mary, her sister Martha, and Mary Magdalene. The Book of Mormon teaches that Christ after his resurrection came to America to preach the gospel to the Native American Indians. The Jesus of Mormonism is not the only true God who was made flesh and dwelled among us. He's a totally different Jesus. He's totally separate and apart from God the Father. They're actually two Gods there. You have the Heavenly Father as one God, and Jesus at best to be another God. Dr. Reagan: Do Mormons have a belief in the Trinity? James Walker: Oh, no, that's one thing the Latter-day Saints are pretty up front about. They don't believe in the Doctrine of the Trinity. They consider it to be a First Century concoction. Dr. Reagan: What do Mormons believe about the Holy Spirit? James Walker: The Holy Spirit they will divide. Joseph Smith, the Mormon founder, would say the Holy Spirit is different than the Holy Ghost. The Holy Ghost, of course, its just two ways of translating the same Greek words hagios pneumatos. But, Joseph Smith developed a whole doctrine around the two being different. The Holy Spirit to them is like an inanimate force or influence of the Heavenly Father and not a person. The Holy Ghost is a person without a body who's a member of the Godhead, and is in effect one of the three Gods that we believe in. The big separation is that Christianity is a monotheistic religion. Christians believe there's only one true God and every other God is a false god. As a Latter-day Saint, I was taught from our scriptures The Pearl of Great Price and the Book of Abraham that gods plural created the Earth. The gods said, "let there be light." Dr. Reagan: When we last talked about cults you said one of the characteristics of cultic groups is that they often use Christian language, but they mean different things by what they're saying. James Walker: Right, and what really bothers me is sometimes Latter-day Saints who know the difference and know both sets of language will purposely use terms that they know will communicate with a Christian audience in a way that makes them sound evangelical and traditional, when the truth is really far from that. 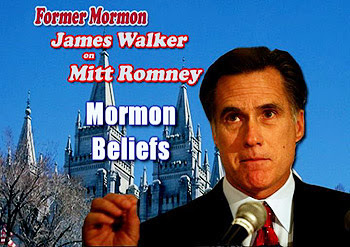 In the last part of this interview with James Walker concerning Mitt Romney's Mormonism, we'll actually chat with an online Mormon missionary to learn what the LDS Church believes firsthand. Something just hit me. The article is on the cult of Mormonism. Fine. L&L has done those before. What is different this time is the "MITT ROMNEY and Mormonism". Why the "Mitt Romney"??? Are you saying a Mormon should not be President? No? Then why single out Mitt Romney? Are you saying we should only elect Christians? Well, the "Christian" we currently have is not a friend of Israel, refuses to say men are are endowed by their CREATOR with certain unalienable Rights, covers up a cross in a church where he is making a speech, etc. Actually, a historical fact is many United States Presidents have doubted or denied the divinity of Jesus. All that being said...MY PREFERENCE is that our President be a true Christian but if the choice is an Obama type Christian or a Romney type Mormon, I'm supporting the Mormon. Clarifying...MY PRAYER and HOPE is for a true Christian president. But if the choice Obama vs. Romney...gotta go Romney. Question: Will God punish the U.S. if we have a Mormon president? How about for the so called Christian now in there? I'm not saying I disagree with the Mitt Romney reference...I just wonder why? In thinking about this on my drive home I thought about who should be Predsident some more. BECAUSE America WAS founded on Judeo-Christian principles and values I would say a president should believe in the God of the Bible (as in OT/NT) and/or their values should be based on the Bible. I guess that mean a protestant Christian (preferably), a Jew, a Catholic or Mormon would be acceptable. A secularist or atheist or buddhist, hindu, Muslim, etc. would not be acceptable. In the end, it is true to say we are electing a chief executive, not a chief pastor? My ultimate ultimate question...does God want us to elect a true Christian or can we elect a non-Christian as long a they believe in Judeo-Christian OT/NT values? In my humble view I say the Trinity can be shown to be scientifically credible because of the Triple point fact of Chemistry. The 3 states would be like the 3 persons of the Trinity and at the Triple point the same substance (or God,exists in 3 different states. Billy .... i know i will probably hear flack for this ....... but personally i believe we should definitely have a Christian for pres .... and neither obama or romney are Christian. Having said that.... i think God wants us to make the best choices with what we have to work with while staying in prayer for our leaders. I think that God is warning us as a country that judgement is coming. Im researching harbingers right now. I think america is in DEEP doo doo if we dont repent and turn back to God. Every single morning I say to God... Lord... what a great day today would be for the rapture!!!! @Billy, from the first segment of this series: "Dr. Reagan: Because of Mitt Romney's presence in the presidential race, the question of Mormonism has been moved to the front burner again. People are interested in Mormonism who have never been interested in it before." That's the reason Mitt Romney's name is in there. As for whether a President has to be a Christian, I think we can all agree - no, it's a secular appointment. Should the President share the same Judeo-Christian values as our Founding Fathers, in my opinion - yes, it's essential to keep us on course and in God's favor. Sorry, but Mormonism is an evil cult and I will not vote for Romney under any circumstances. Do you know that they have a prophecy about a Mormon taking control of the White House and exercising religious authority? Read their prophecies and read the Bible and then you decide if you would vote for a Mormon. In the judgment of President Reagan and of the President Bush, of the FBI and CIA (both replete with Mormons), of our armed forces (with many Mormon high officers), there are no more patriotic Americans than the people called Mormons…..Yet the Mormons, if they are at all faithful to the most crucial teachings of Joseph Smith and Brigham Young, no more believe in American democracy than they do in historical Christianity or in Western monogamy, Smith, Young, and their followers believed in theocracy, or the inspired rule of the Saints, and looked forward to each prophet in turn ruling over the Kingdom of God, as king, first here and then everywhere. The key in this quote from White's book is the conept of the creation of a theocracy.